Beauty and the Beast's Belle in an exquisitely detailed gown. The breathtaking stone resin statue stands about 8-inches tall. Be our guest and order yours now! Beauty and the Beast's Belle is every inch a beauty in haute couture. Tonal pieces and a subtle rose-inspired print add luxurious depth to her exquisitely detailed gold gown, while sculpted tassels and scarlet faux gems lend a memorable finish. 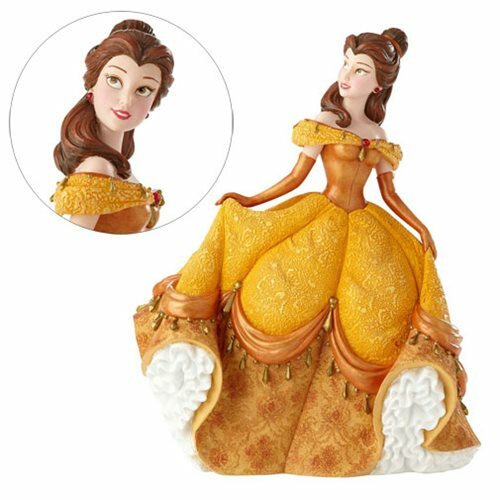 This breathtaking hand-painted Disney Showcase Beauty and the Beast Belle Statue stands about 8-inches tall and is made of stone resin. Be our guest and order yours now! Jurassic Park Nedry and Dilophosaurus Pop! 2-Pack - EE Excl.